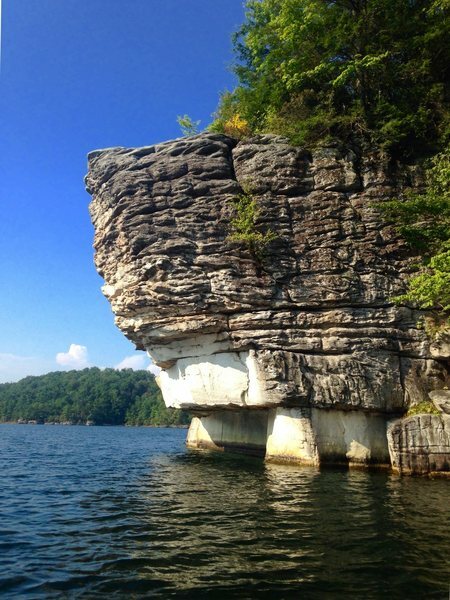 Summersville Lake is formed in the gorge of the Gauley River, and houses one of the New River Gorge's best concentrations of sport lines from 5.6 to 5.14d. Overall, the rock is more featured and more closely bolted than the lines of the New River Gorge proper. Be aware that many lines (including literally ALL of Long Point and Whippoorwill) are inaccessible except by boat from about April to November, due to the reservoir waterline. Deep water soloing can be popular here, but is illegal. Follow Rte. 19 north from Fayetteville and the NRG for about 20 miles. After crossing the obvious bridge over the lake (with views of the cliffline on both sides), park in a large lot on the east (right) side of the road. Although the following directions may sound complex, if you just follow the main signs of foot traffic, you'll get directly to the crags. Follow Rte. 19 north out of Fayetteville for about 20 miles, almost reaching the town of Summersville. After crossing the obvious Gauley River bridge, park in a large lot on the east (right) side of the road. Follow a wide trail through a gate for 5-10 minutes keeping an eye out for a left exit that descends down over a small creek. Just pass this creek crossing and at a gravel berm, take a right back into the woods via a more narrow trail. Follow this for another 5-10 minutes before taking another right down to a creek, and then a ladder that puts you near the DC Memorial Boulder. Go to the ladder, then double back to the first right and keep your dog leashed, stay right for ~10 minutes until you find two houses. When on the trail follow the red blazed tress down the to gully. This puts you out about 3-5 minutes climber's right of Orange Oswald. Please remember to keep your dogs leashed in this area. To the "Summersville lake parking lot". 205 Up Yonder Drv. Summersville WV 26651.
from Fayetteville take Hwy 19 north for 21 miles. Drive over the only big bridge over a big lake with a sign that says "Hughes Bridge - Summersville Lake". Then immediately turn right on the first little side street; this is at mile marker 39.0. Then you will see a big gravel lot on your right where you will park. Hike on the dirt road behind the gate up the hill. After about 8 min's, you will turn left off the dirt road down the first well traveled, narrow foot-path which heads down into the woods. After a few minutes, this path will take you across a stream beside a very old, wooden, rotting bridge. I too tried a few "not" trails and after some unnecessary bushwacking and poor orienteering found the correct way, so wanted to add additional clarification for first-time venturers like me. Getting to the stream crossing is fairly straightforward. Once you cross the stream, you will head slightly uphill. The trail actually diverges here to the left and right. You want to stay to the right. At the time of writing, there is a small rock cairn that marks the correct path. There is also a trail marker with a crudely scrawled "Rock -->" that can be hidden by branches. You'll keep hiking for a little ways and then once again the trail will split. You want to stay to the right again. There is also a rock cairn at this point as well. You'll know you're going the right way if you see trees marked with red blazes and Army Corps of Engineers boundary signs on the trees. From this point the other directions are accurate.